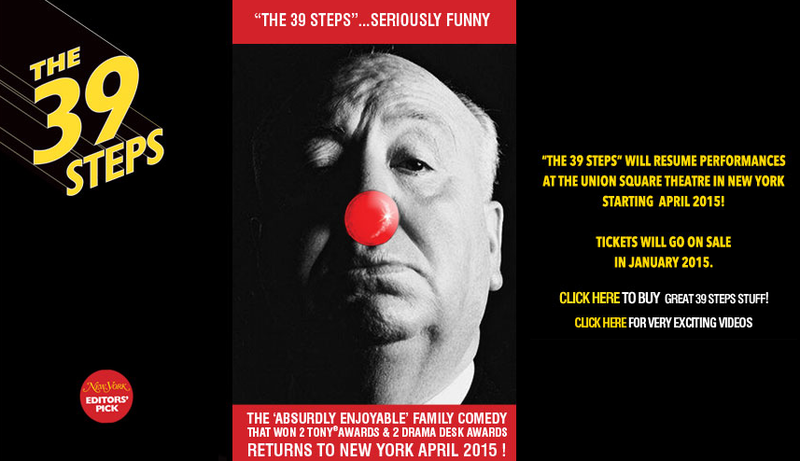 Image of the homepage for “The 39 Steps” at the Union Square Theatre starting in April. “The 39 Steps” was a serious 1935 Hitchcock movie about spies between World Wars, handsome heroes and classy dames. Then Patrick Barlow turned the story into a delightful stage spoof that soon will be returning to NYC at an off-Broadway house. It’s coming back billed as a family comedy and according to the NYTimes, producers hope it will become a long-lasting theater staple like “Blue Man Group” or “Stomp.” Tickets go on sale in January for the show at the Union Square Theatre, 100 E. 11th St. (catch a show when the famous Union Square Farmers Market is open and kill two birds with one stone). The spoof, first done in England to much awards, spent a couple of years at various theaters on and off-Broadway through January 2011 and, after it closed, then became a staple at regional theaters around the country. A spring 2012 production of it at the George Street Playhouse in New Brunswick (NJ) was excellent and thoroughly enjoyable, especially as both my 19-year-old son and I are Hitchcock fans. But you don’t have to get all the puns and allusions to “Strangers on a Train,” “Rear Window,” “Psycho,” “Vertigo” and “North by Northwest” to enjoy the show. And, of course, Hanney’s character is the classic Hitchcock everyman who, through no fault of his own, is suddenly a murder suspect running from the authorities with the help of cool blondes. For more info, visit the show’s website by clicking here. EDITOR’S NOTE: Word of caution, if you caught the BBC’s “The 39 Steps” (2008), it has a completely different and much less satisfying ending.